In the early 1990s, Channel 4 screened a short season of movies based around particular actors. First up was Robert De Niro. Across five or six consecutive Sunday nights, the channel showcased some of Bobby’s greatest work. It started with the big guns, things like Goodfellas, The Deer Hunter, Raging Bull and The Godfather Part II. But later weeks weaved into movies such as The King Of Comedy and Jacknife – movies that may not have been easily accessed down at the video shop. The series was a simple but brilliant idea – it’s a wonder Film4 don’t really bother with it now. 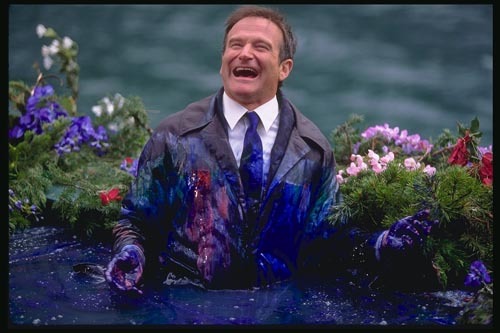 As well as De Niro, there were a good run of Sunday nights dedicated to Robin Williams. It opened with Good Morning, Vietnam, quintessential Williams if you like, his motor-mouthing calling card. As a movie-watcher not yet in my teens, I found him mesmerising, a gag jukebox on legs. I can’t remember the next movie in Channel 4’s series on Williams, but somewhere along the line they got to Popeye, Robert Altman’s disastrous live action version of the spinach-guzzling cartoon hero. Even the 12-year-old me could tell this film was a mess. But that’s one of the reasons I loved Robin Williams – he did some awful films. But even the awful ones had moments from Williams which you could admire. Jakob the Liar almost outdoes Life is Beautiful in the slippery slope of syrupy stakes. Look up ‘cloying sentimentality’ in the dictionary and you will find Patch Adams. And Happy Feet too. He was in Nine Months and Licence to Wed. These are all bad movies, and yet Williams always managed at least one moment where he made you smile or made you laugh. These sit at one end of the spectrum to Williams’ more celebrated selection – things like Mrs Doubtfire, Good Will Hunting, Jumanji, Dead Poets Society – but it was his middle ground where the actor was really interesting. Speaking of Williams and De Niro, their work together in Awakenings, in which Williams plays the straight role of doctor to De Niro’s hospital patient, is terrific. And it’s a underrated movie. The World According to Garp out-Gumps Forrest Gump a good 12 years before Forrest Gump came along. What Dreams May Come is about heaven and hell and co-stars Cuba Gooding Jr – so is in places as bad as it sounds – but it’s also a beautiful failed experiment in filmmaking. Cadillac Man is imperfect but sweary fun, while Williams’ voice work as Batty in the unheralded Ferngully: The Last Rainforest is the perfect dry run for his performance as Genie in Aladdin later the same year. Not every movie touched by Williams turned to gold, but they all had their golden moments. Because he was in them. This entry was posted on August 12, 2014 at 4:27 pm and is filed under COMMENT with tags Robin Williams. You can follow any responses to this entry through the RSS 2.0 feed. You can leave a response, or trackback from your own site. Liked the post – and the site – so much so that I’ve nominated you for a Liebster Award. Check it out here: http://thedullwoodexperiment.com/2015/11/09/the-liebster-award/ Keep up the good work!